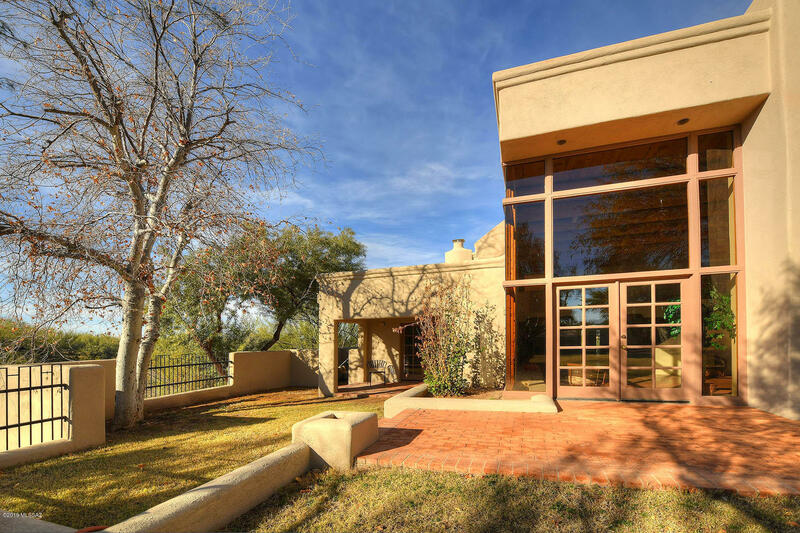 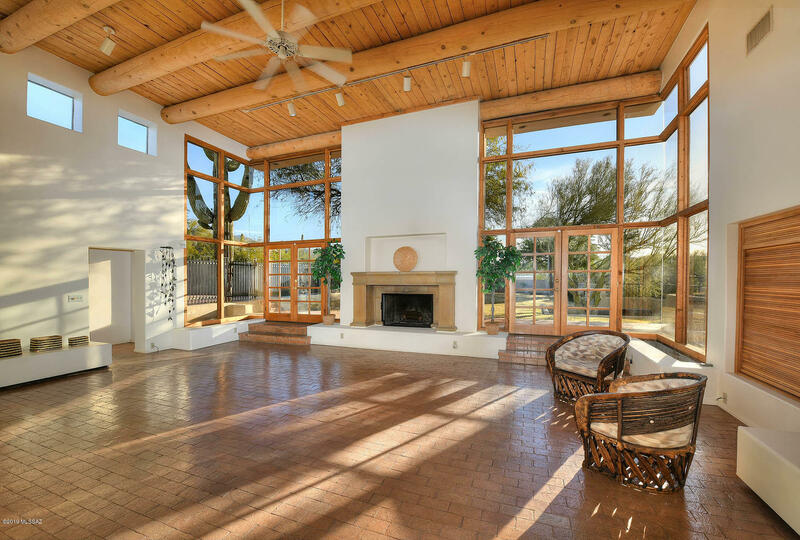 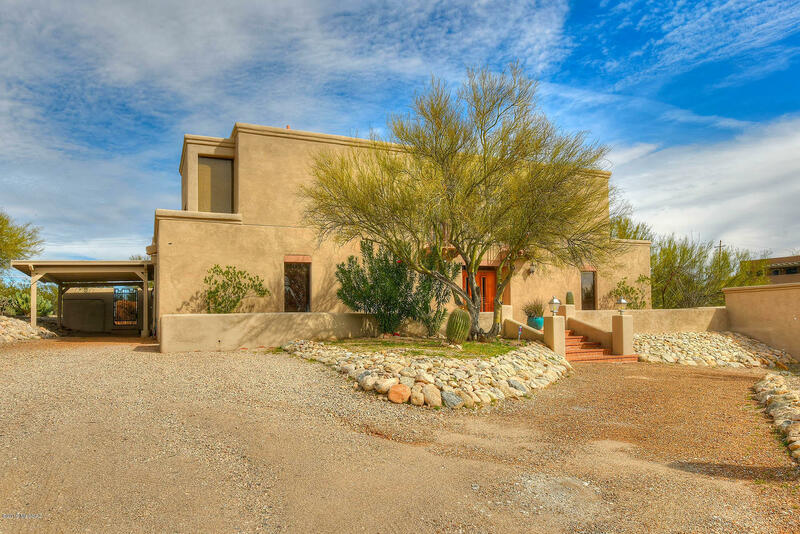 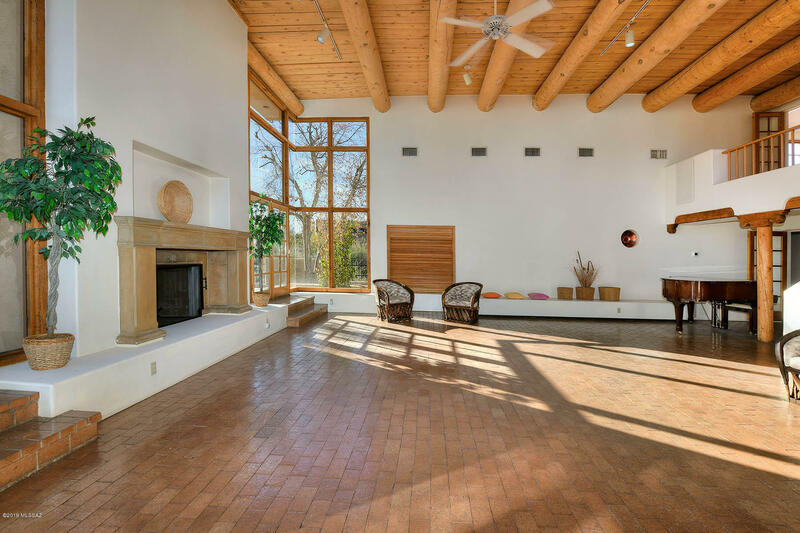 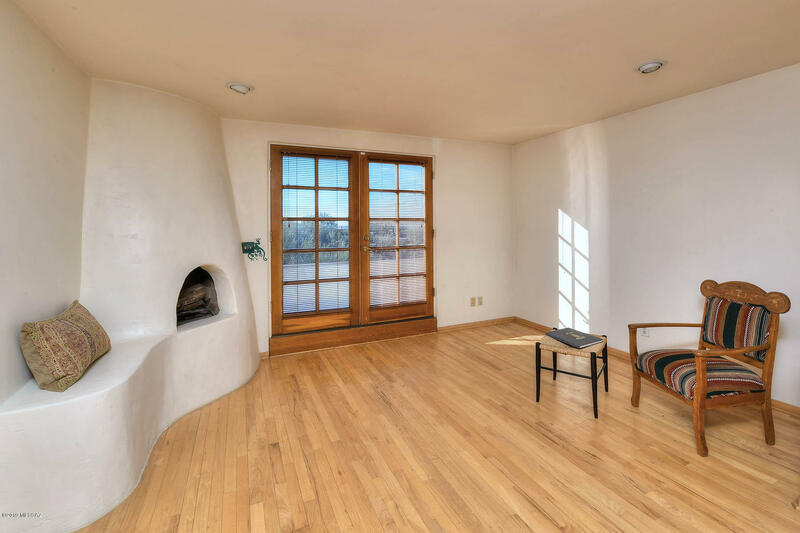 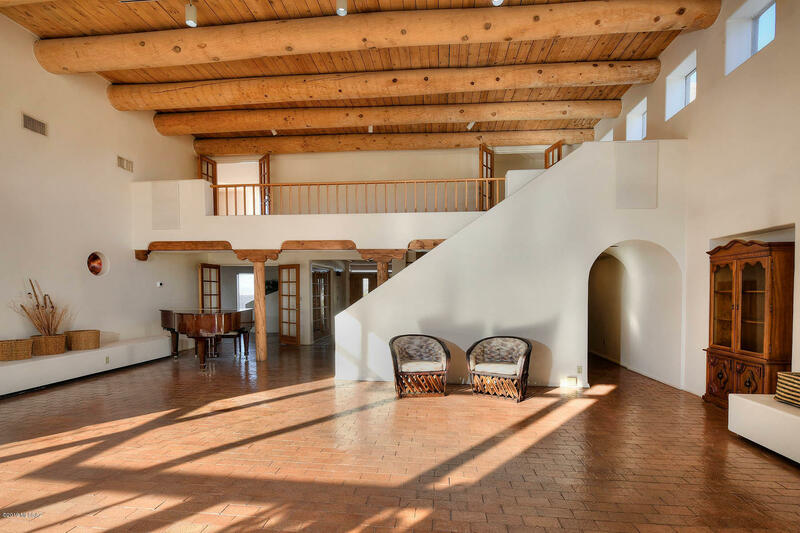 HANDSOME CONTEMPORARY SANTA FE, 16' VIGA+BEAMED CEILING IN GREAT RM ACCENTED BY SOARING 2 STORY EAST FACING WINDOWS AND MASSIVE FIREPLACE. 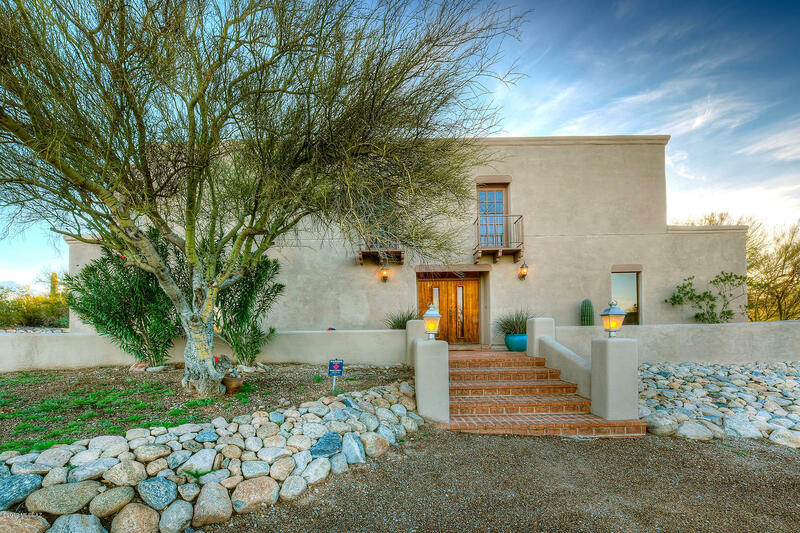 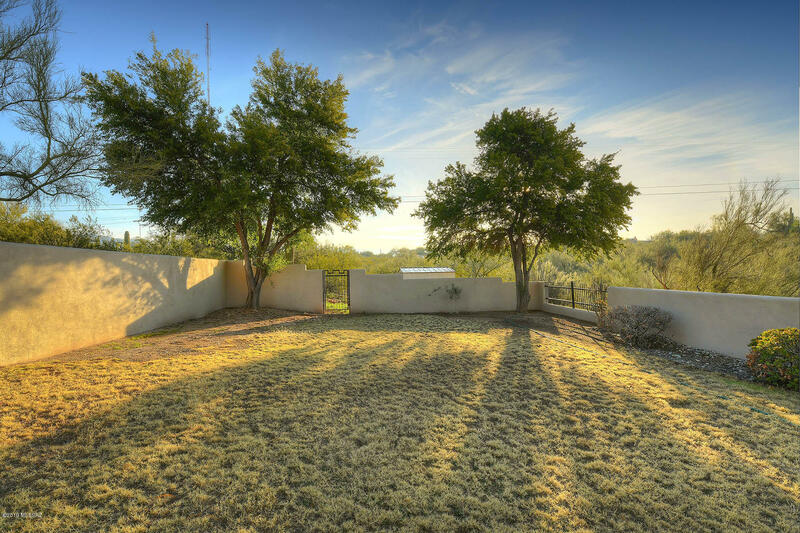 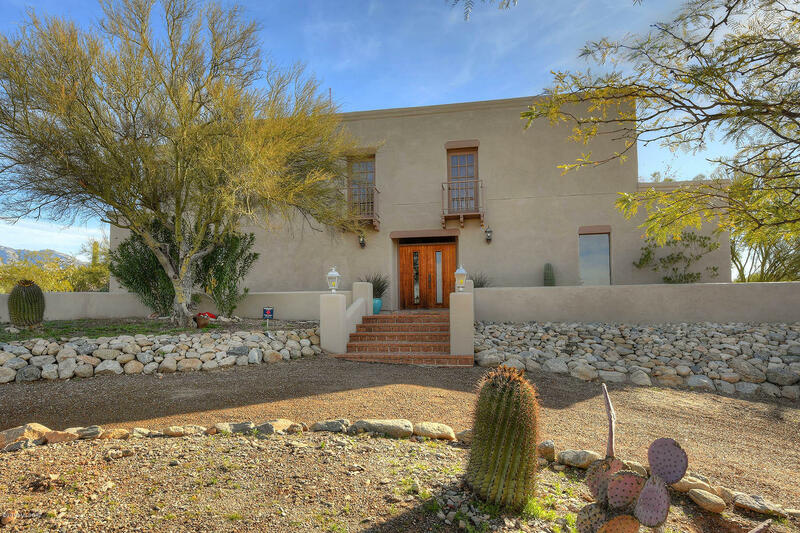 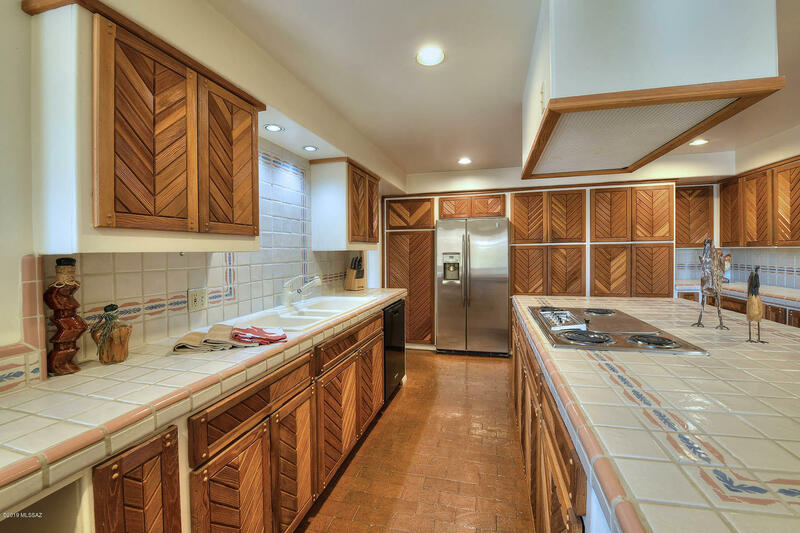 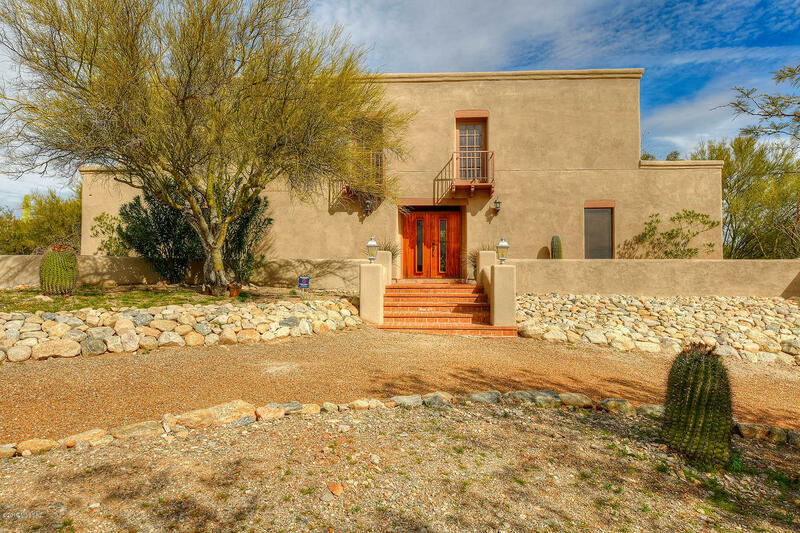 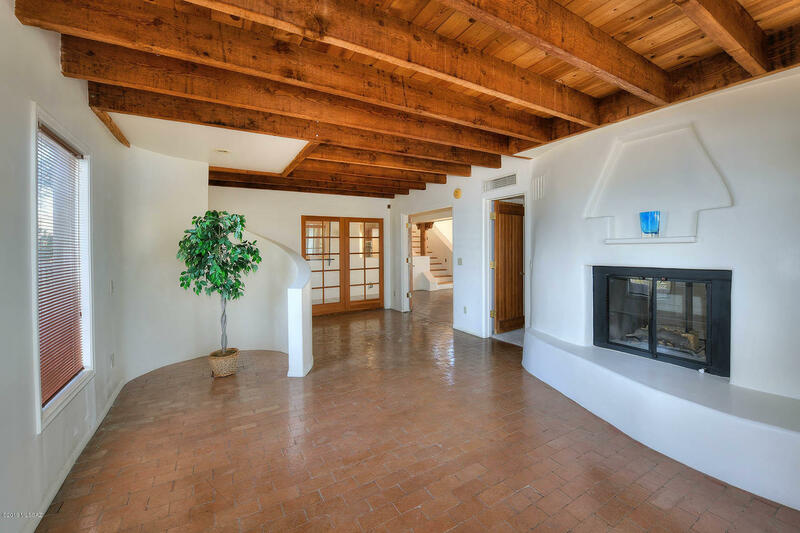 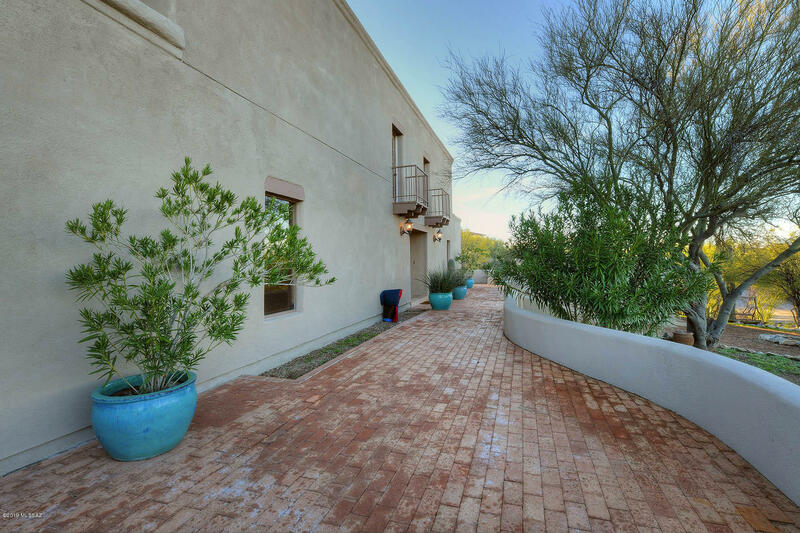 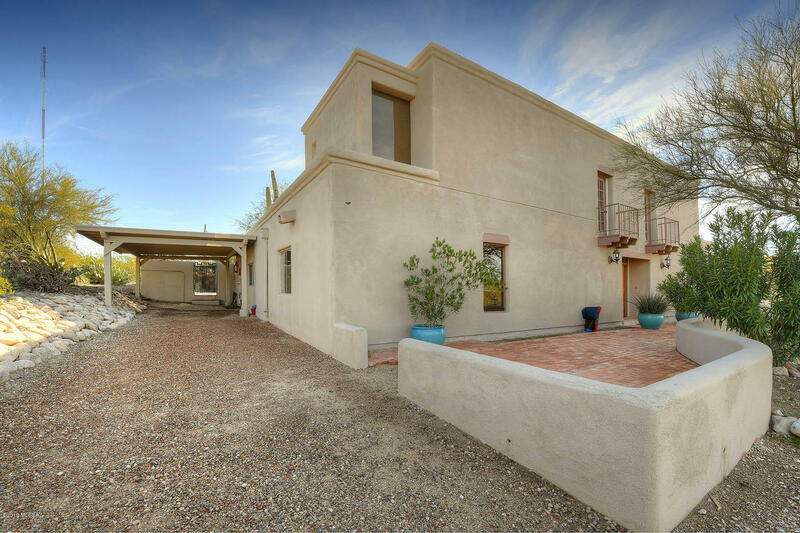 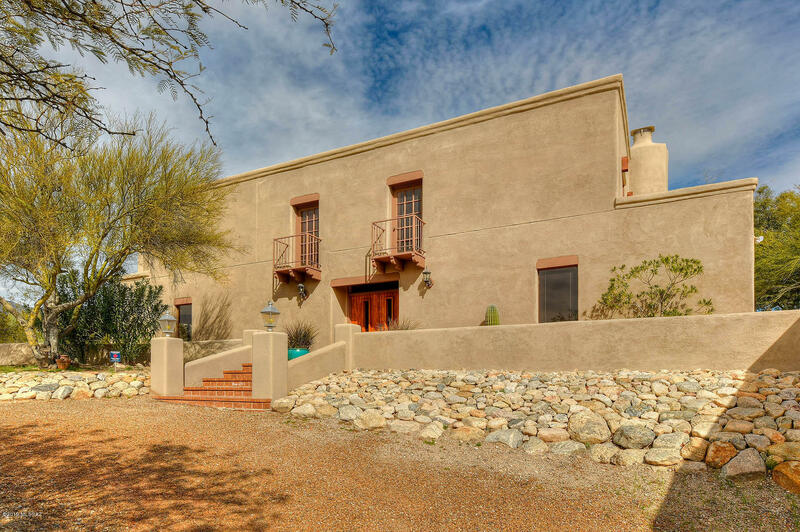 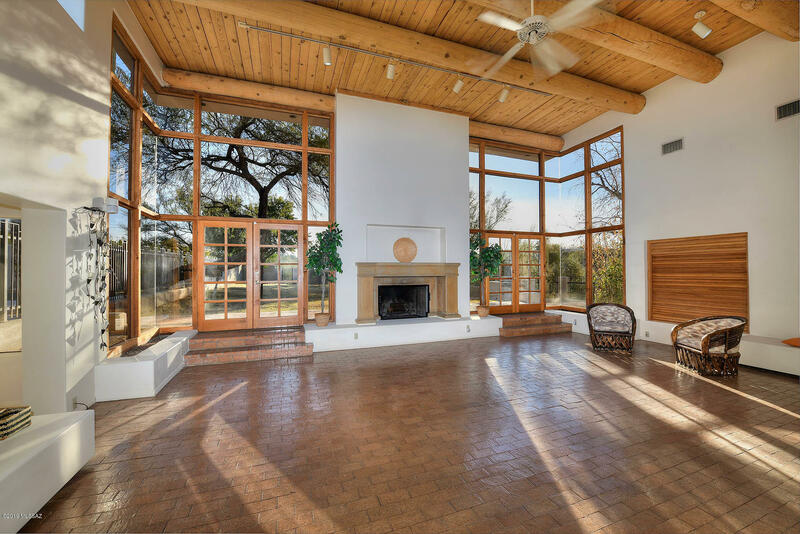 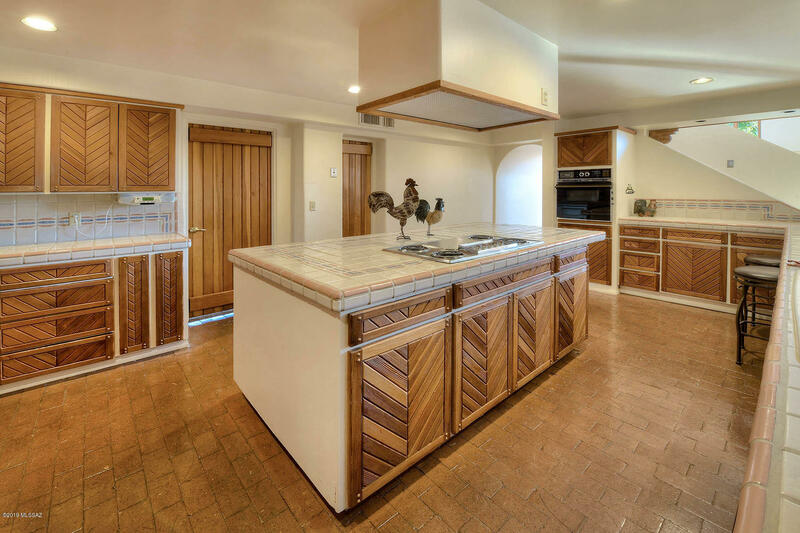 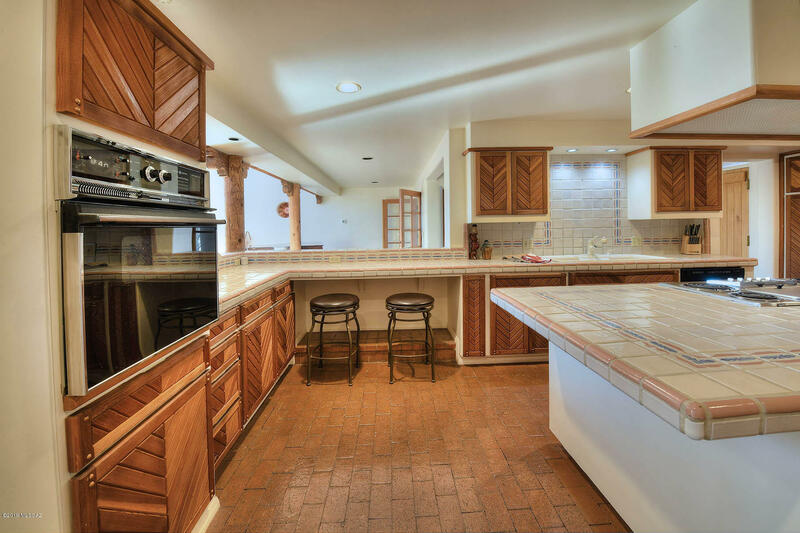 FRENCH DOORS, 3 FIREPLACES, BRICK FLOORS, HANDMADE MEXICAN TALAVERA TILE KITCHEN/BATHS. 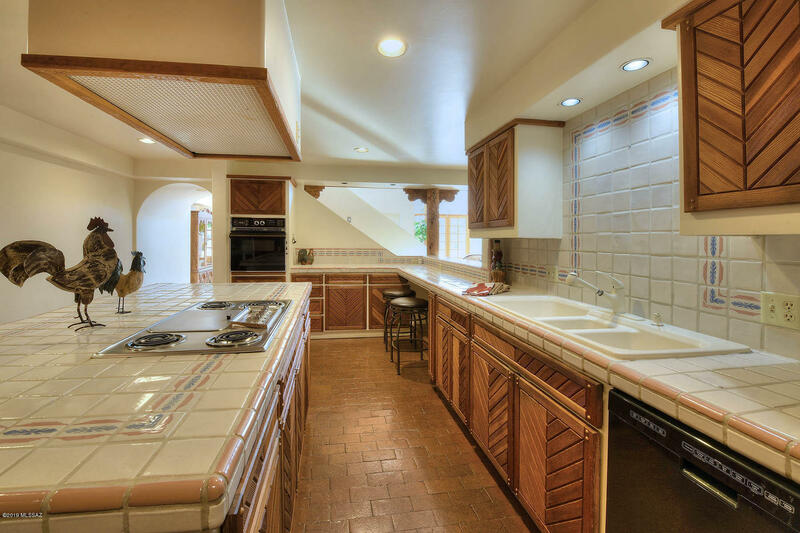 VERY LARGE KITCHEN WITH CENTER ISLAND, SIT UP BAR, SOLID WOOD SW CABINETRY, WALK IN PANTRY. 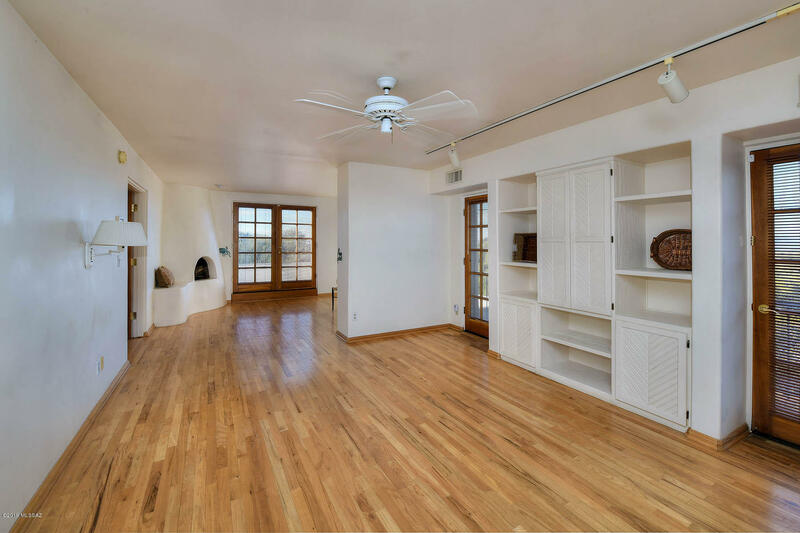 UPSTAIRS HARD WOOD FLOORING IN LIBRARY STYLE LANDING LOFT OVERLOOKING GREAT ROOM AND ADJOINING SPACIOUS MASTER BEDROOM SUITE. 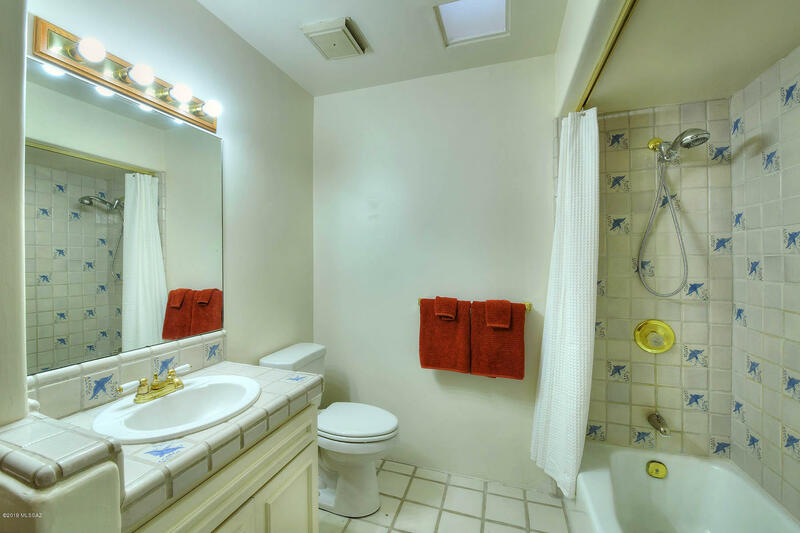 LARGE ENSUITE MASTER BATHROOM HAS JACUZZI TUB, SEPARATE SHOWER, DUAL SINKS. 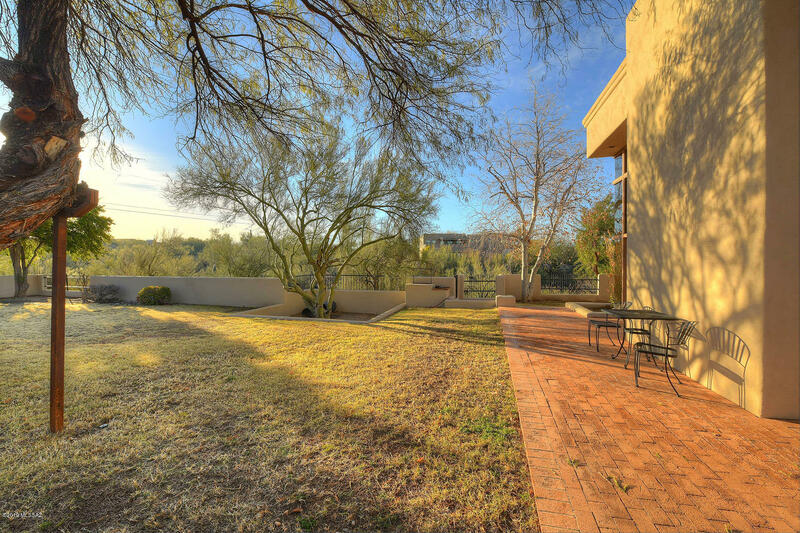 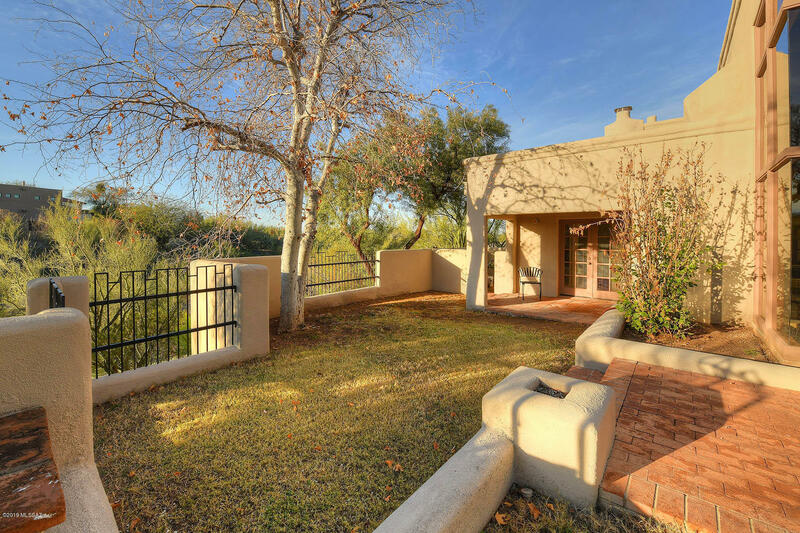 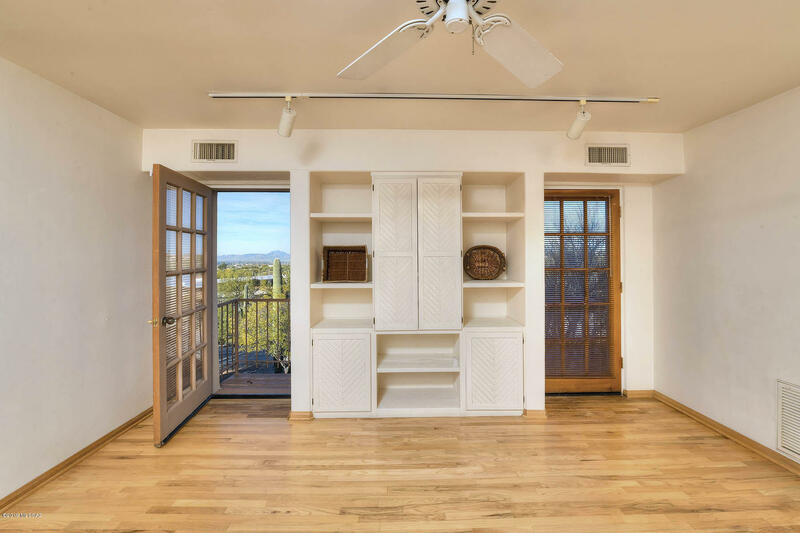 BEDROOM HAS 2 FRENCH DOORS ON WEST WALL OPENING ONTO BALCONY AND SPECTACULAR SUNSET /DESERT VIEWS FROM 2ND STORY PERCH. 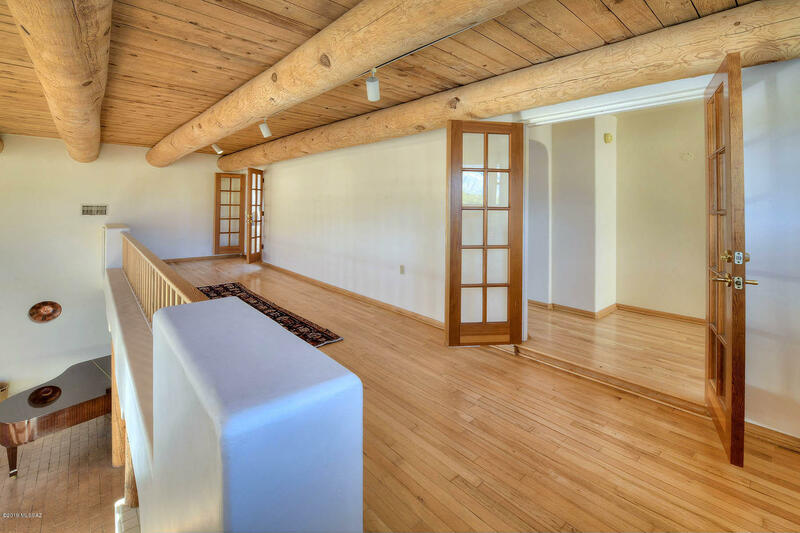 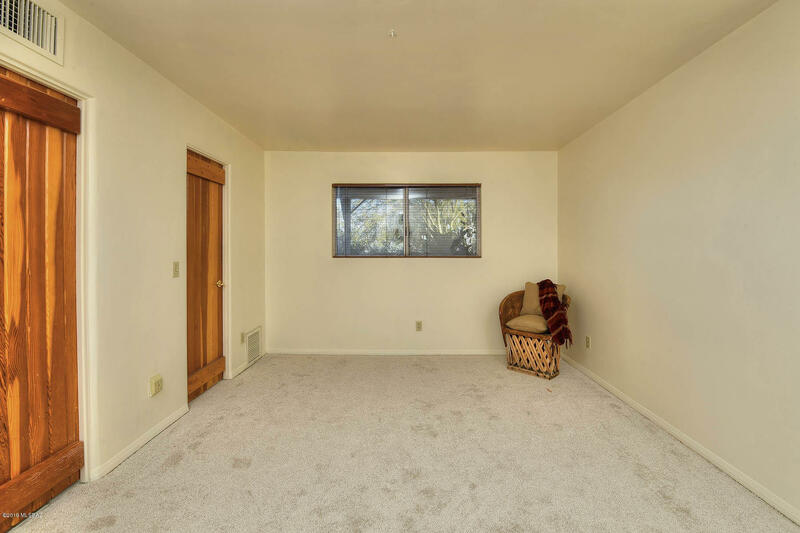 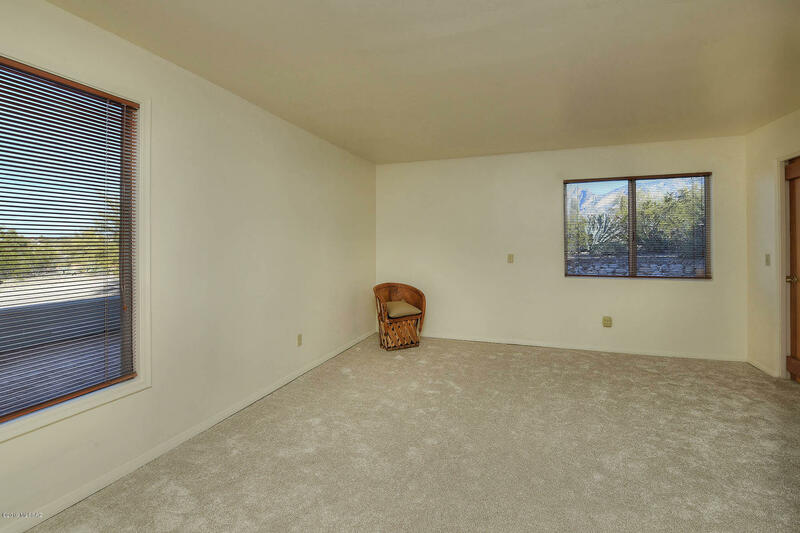 ON SOUTH SIDE OF MASTER BEDROOM SUITE IS A COZY SITTING ROOM WITH BEEHIVE FIREPLACE AND FRENCH DOORS TO SOUTH BALCONY. 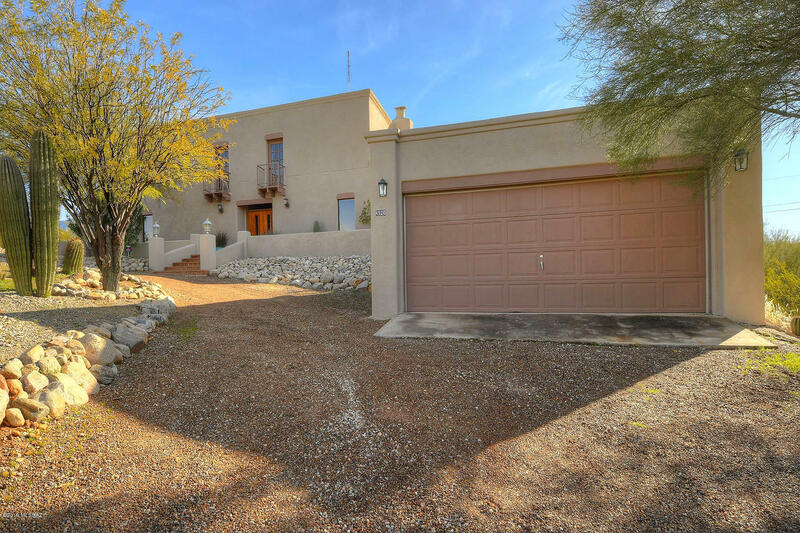 Directions: From River, North on Pontatoc, East on Sarnac, North on Flecha Dr. to 4520 on east side of Flecha Dr. OR South on Pontatoc from Sunrise, Left or East on Flecha Dr. and follow around to 4520. 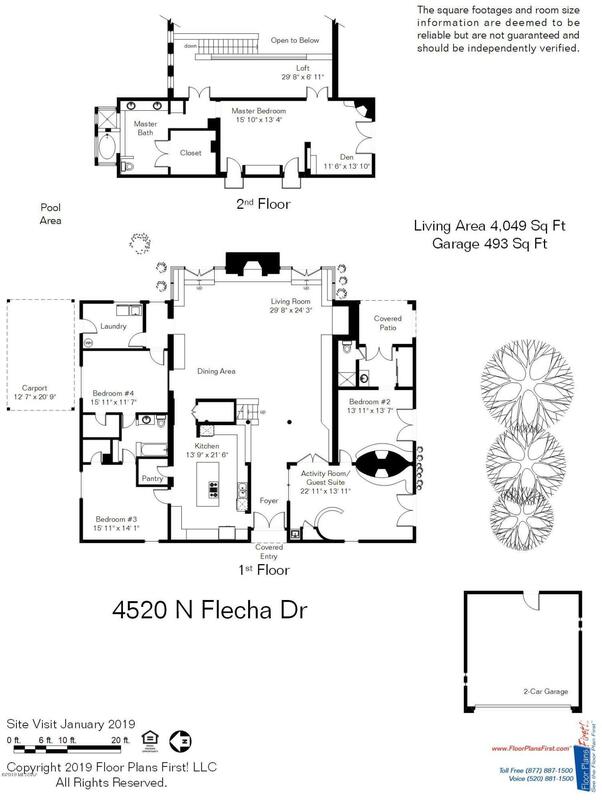 SPLIT BEDROOM PLAN HAS 2 BEDROOMS AND JACK AND JILL BATH ON NORTH SIDE OF HOUSE FIRST FLOOR FROM KITCHEN AND GREAT ROOM. 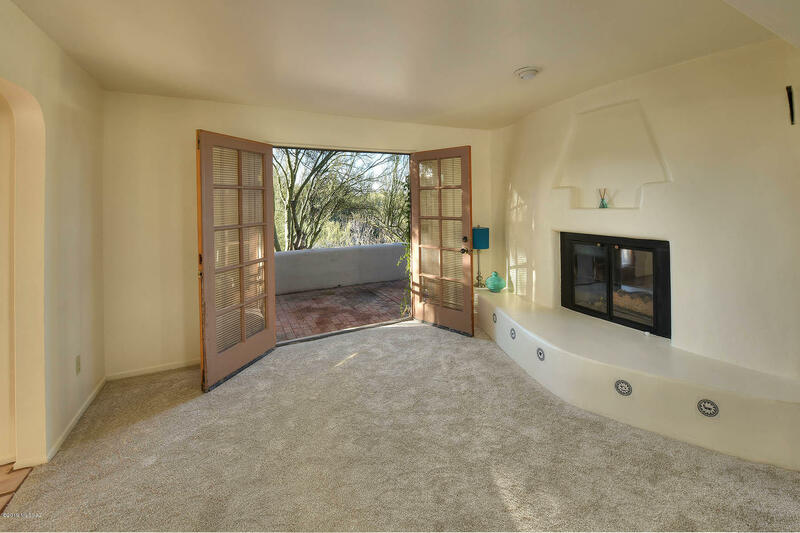 SOUTH SIDE OF GREAT ROOM FRENCH DOOR ENTRY TO ENTIRE GUEST SUITE W/SITTING ROOM SHARING DUAL FIREPLACE TO BEDROOM AREA AND ENSUITE BATH. 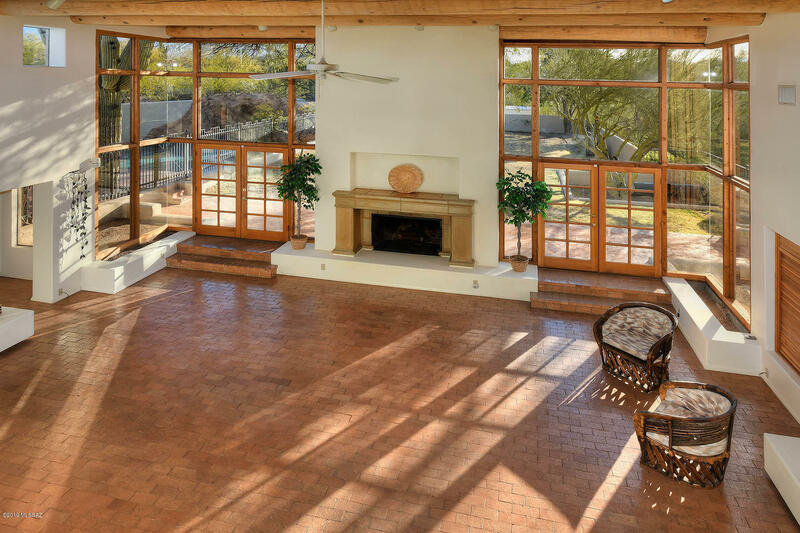 FRENCH DOOR PATIO ACCESS. 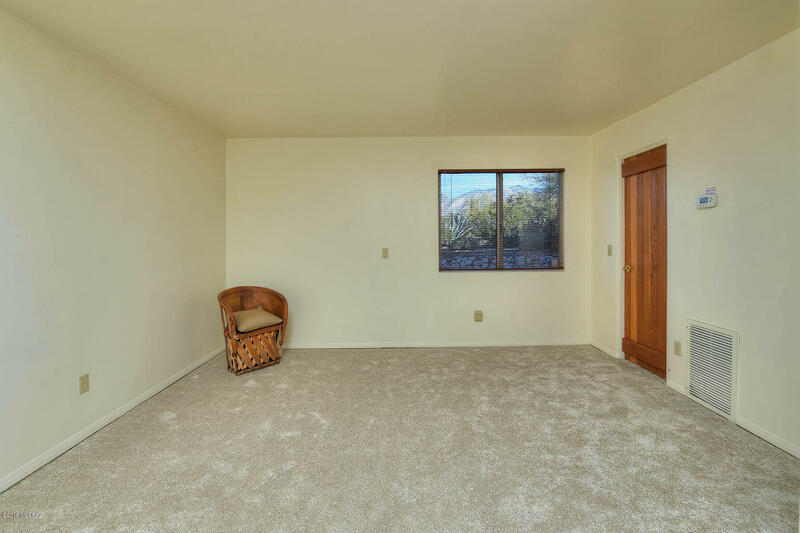 OR 4TH BEDROOM AND ACTIVITY ROOM IN LIEU OF GUEST SUITE. 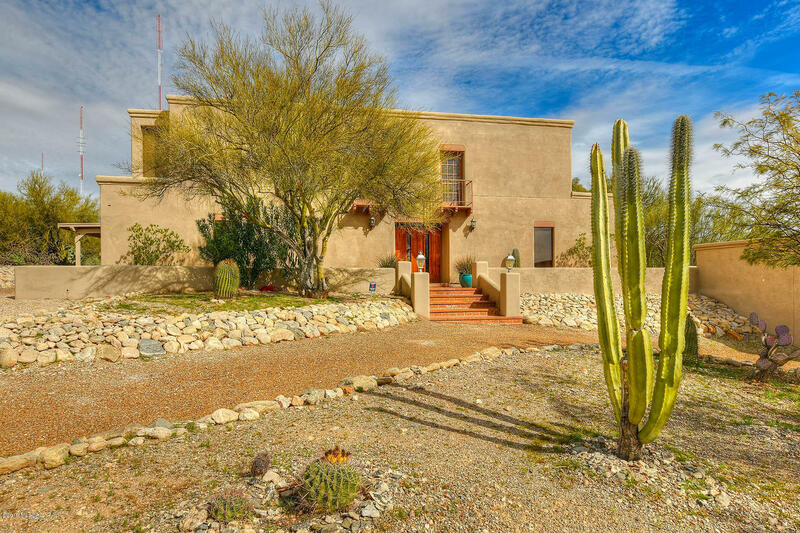 CENTRAL FOOTHILLS HORSE PROPERTY WITH EASY ACCESS TO WASHES FOR RIDING ACCESS. 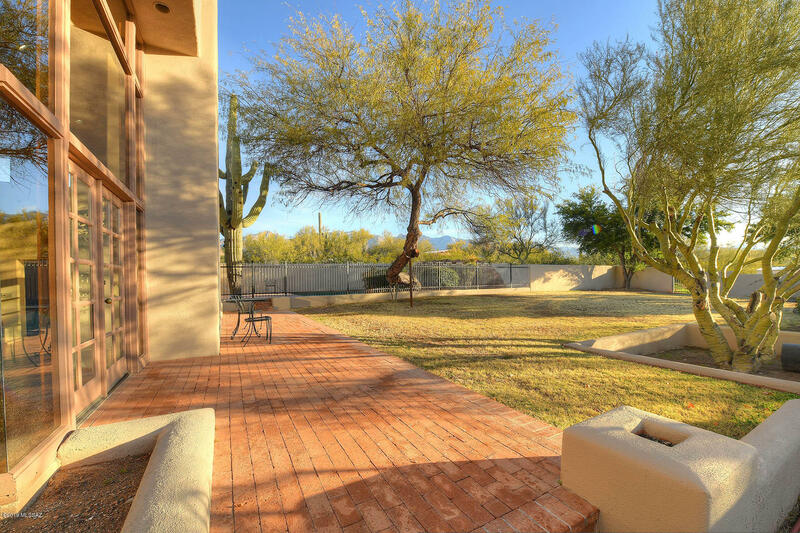 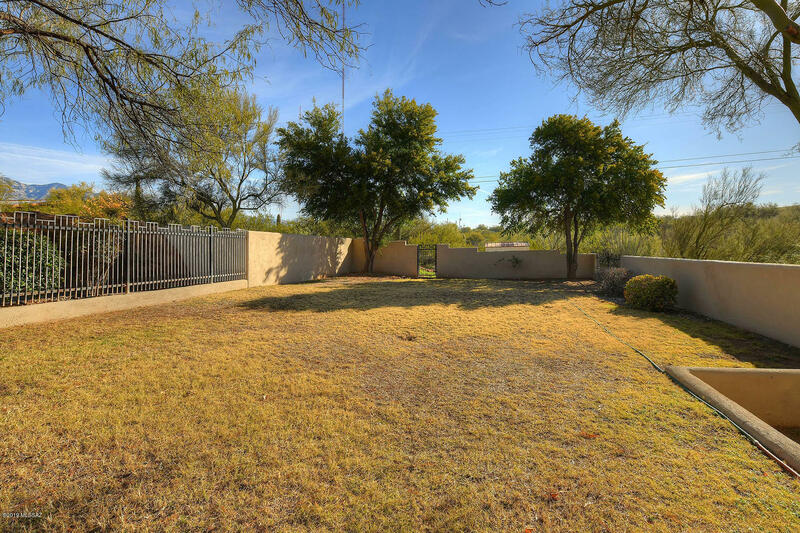 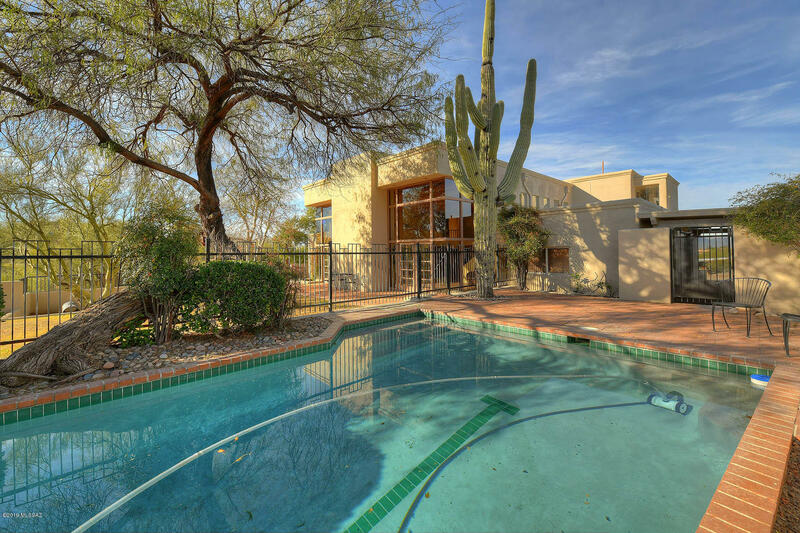 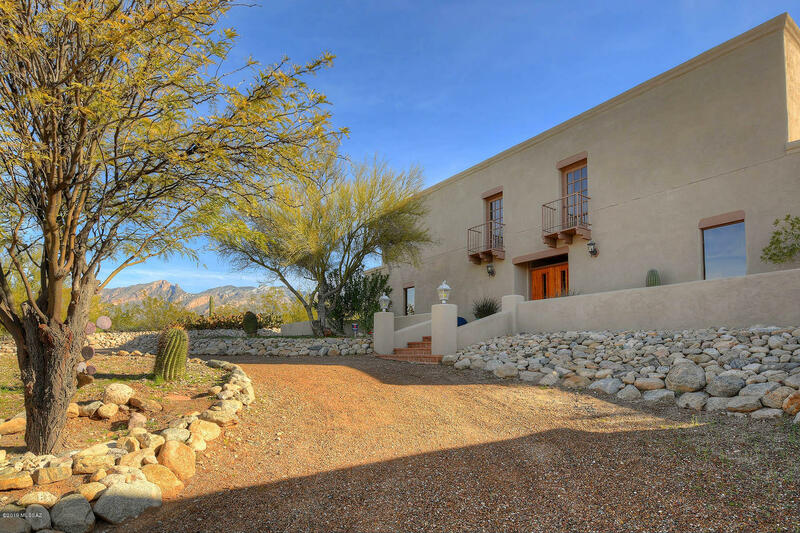 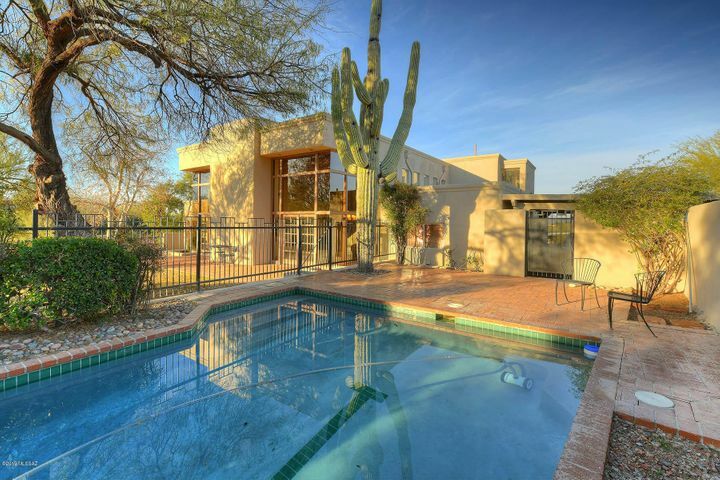 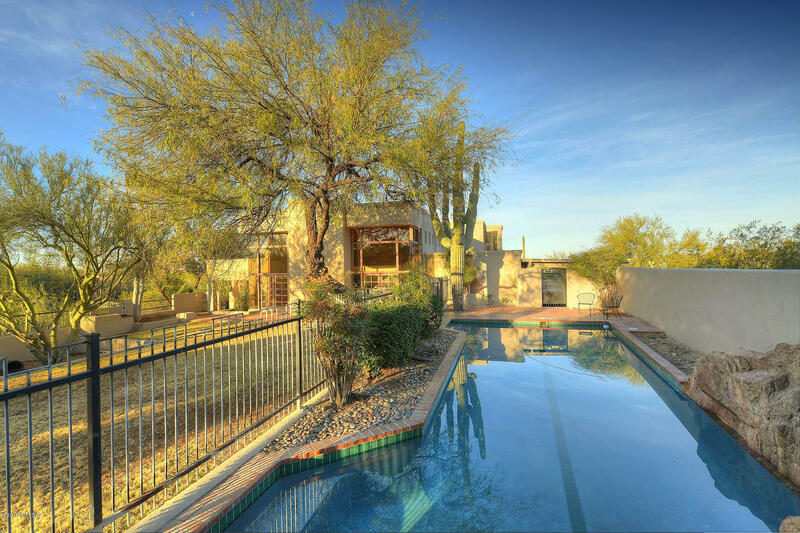 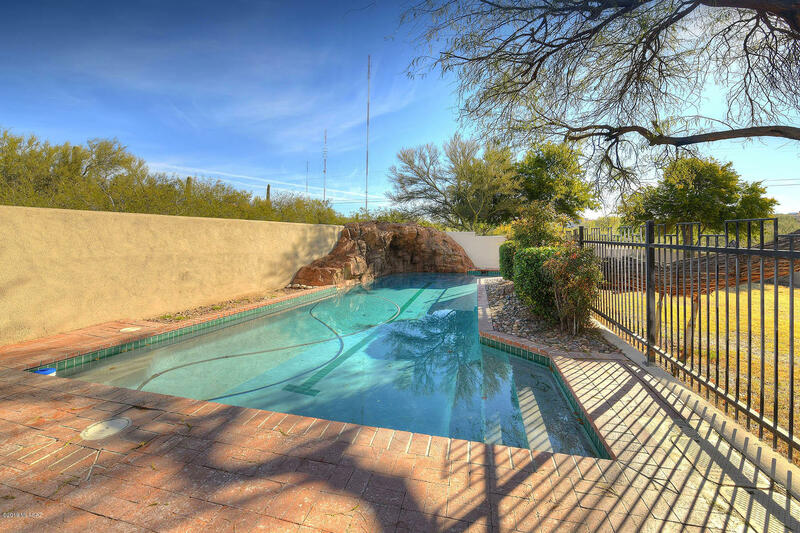 TERRIFIC LARGE SWIMMING POOL AND REAR EAST AND NORTH FACING PATIO AND YARD WITH CATALINA MOUNTAIN VIEWS. 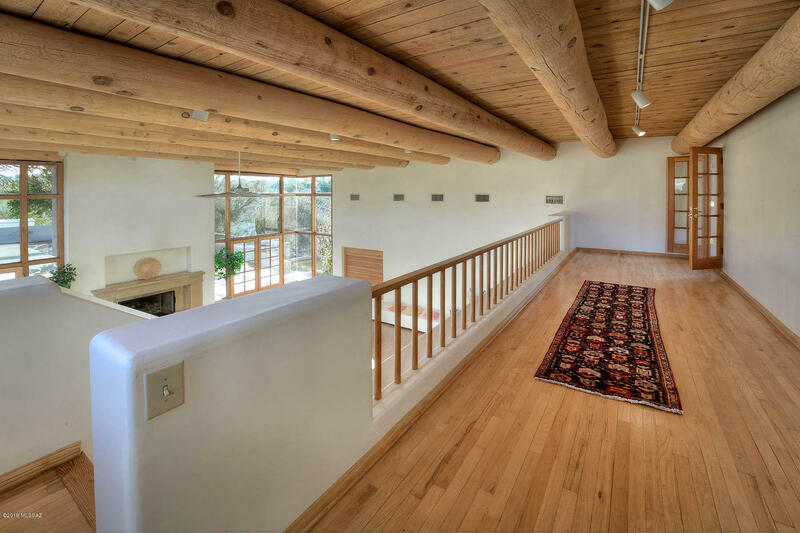 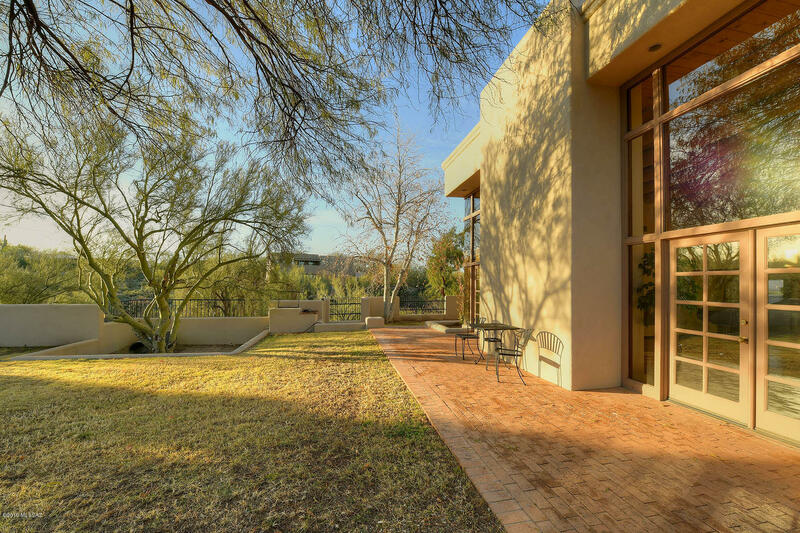 4049 SF, .74 ACRE CUSTOM HOME IN IDEAL CENTRAL FOOTHILLS LOCATION. 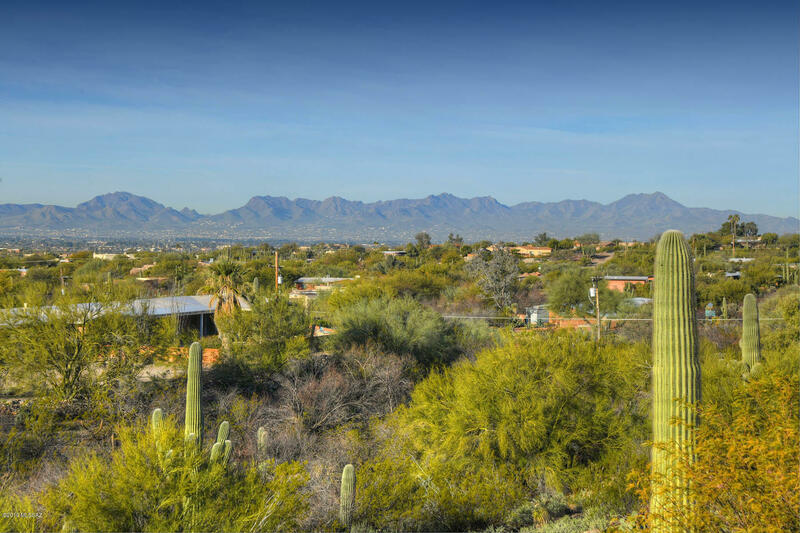 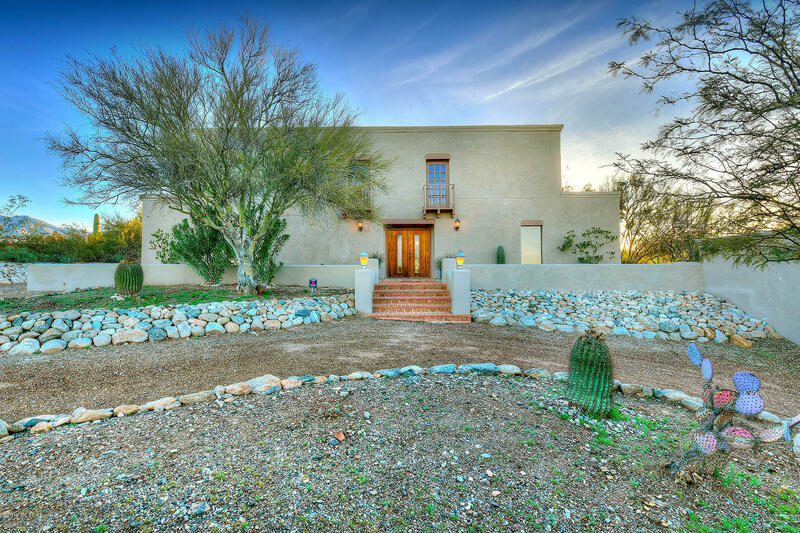 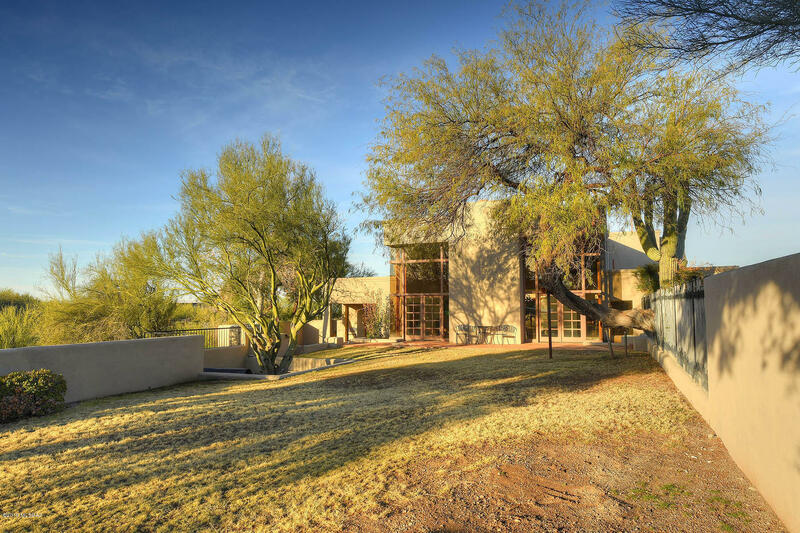 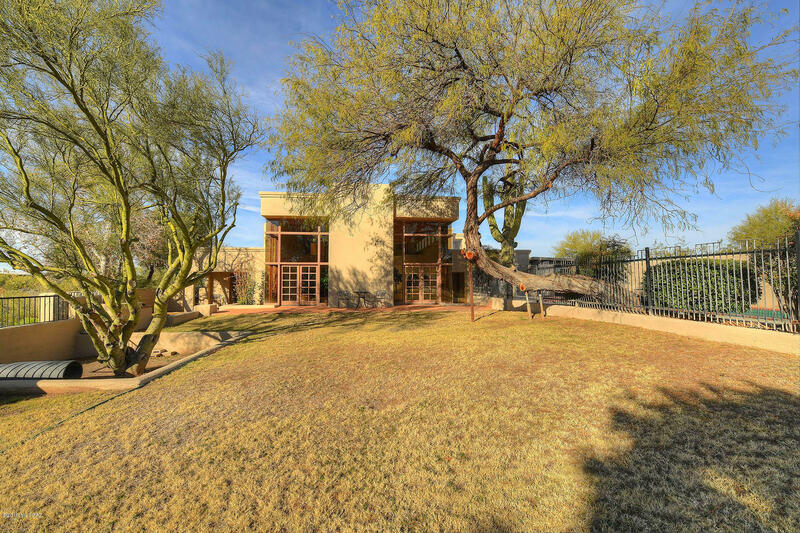 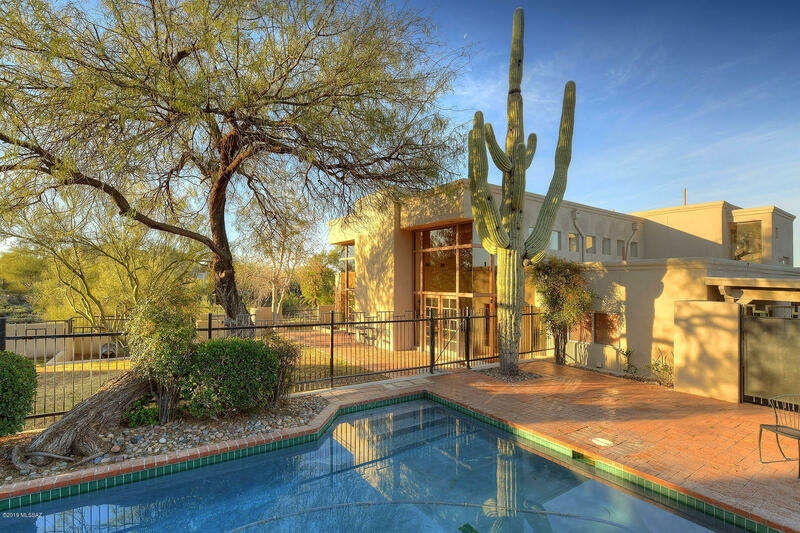 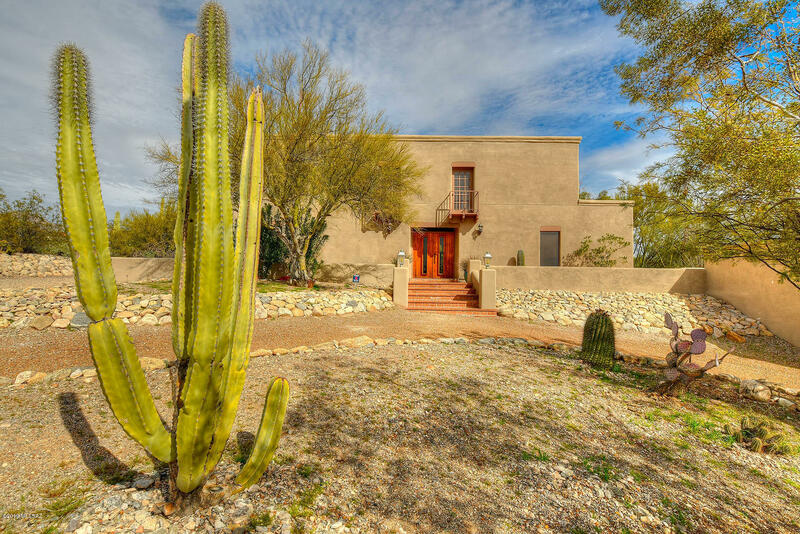 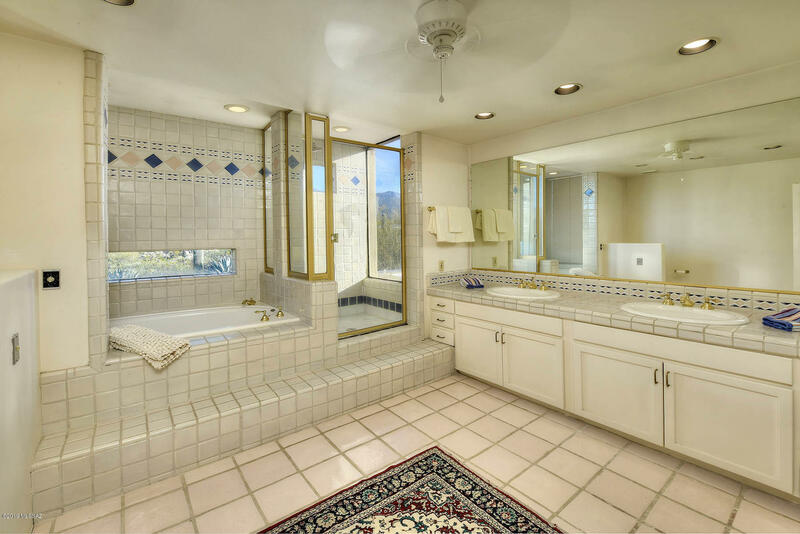 AFFORDS PRIVACY WITH SONORAN DESERT AMBIANCE.